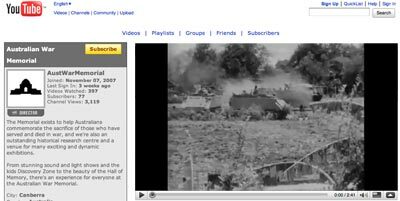 I discovered that the Australian War Memorial has its own channel on YouTube the other day when doing some research on the Vietnam War for a series of lessons designed for my Year 10 class. I showed the students a variety of video clips focused upon the Vietnam War. The clips were authored by war enthusiasts, students, news media outlets and several by the Australian War Memorial. I asked the students to compare the clips in terms of credibility, bias, usefulness and accuracy. Honing their Internet research skills and capacity for critical thinking, methinks. This week several colleagues dropped by my desk with questions about PowerPoint and embedding video. Each had a different problem. It is a little weird when staff possess identical laptops and operating systems yet PowerPoint and video behave differently. Well, not that weird really. Typical if anything. That is another story. But then there is this nifty little button or “bookmarklet” that you can drag to your browser’s toolbar. 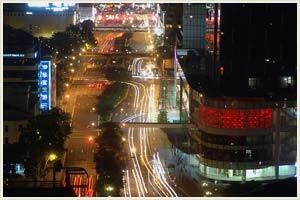 It is located at this page on the GoogleSystem blog. This is “old news” but good news. Simply click and drag the rectangle that states “Get YouTube Video” to your browser’s toolbar and that’s it. Simple, elegant. 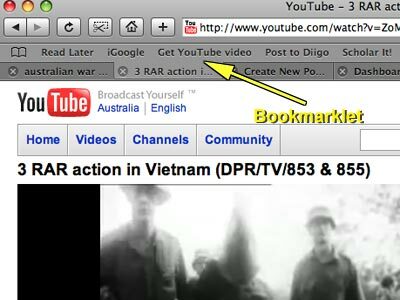 Next time you visit YouTube and locate a video that meets your needs click on the “Get YouTube Video” bookmarklet on your browser’s toolbar. A download of the high quality version of the video will commence. The downloaded file will be in .mp4 format. The video will launch once the download had completed. You will need to rename that file. Each download has the same generic name which is “video.mp4″. The video will insert within a PowerPoint presentation.